Google Plus is the new Generation Social Networking which will be Launched by Google in few months. It is believed that Google+ will kick out Facebook when it comes to Public. That’s the story of Future who beats whom. Any ways China blocked Google+ Before it was released. Any when it will be released, so people will manage some way on how to access Google+. Now the issue arises for people who are Facebook and they love Google+ and don’t want to loose their friends only because of Google+ and will for sure won’t come and miss this amazing new Google+ thing. So a developer called Crossrider might be one of those guys who will miss Facebook so much that he integrated Facebook in Google+. This is true. Now you can connect to your Facebook account and see the stream of your Facebook on Google+ with a simple Plugin which is free and easy to Install. 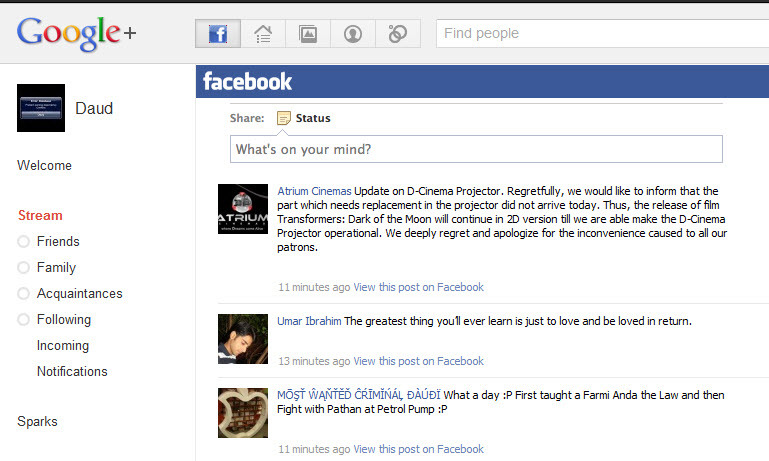 Once the Plugin is installed, you will see the Sign of Facebook on top besides the Home button Google+ Home. The stream will look like this. Get Google+ Invitations for Free. Once you are done and in Google+ Download this Plugin From here and install it. Once done you will soon be able to connect to Facebook and Enjoy the fun.